Malden is a community in the middle. Its median household income in 2010 was about the same as the median for all Greater Boston. It has a large component of single-family houses and had roughly twice as many sales of single-families each year as did Weston. It makes a good subject for the study of price trends for a middle-income community. The price trend for Malden single-family houses from 1987 to 2015 is shown in the chart that follows - again, from data of The Warren Group. It shows prices in decline after 1989, followed by strong increases from 1997 through 2005. Prices declined as they did for most communities after 2006 but rose again from 2012 to 2015, to return roughly to a level equal to the 2005 peak. As was the case in Weston, changes in Malden prices do not appear to have been affected substantially by changes in Malden house styles. The median Malden house in 1990 was similar to the median house in 2010. In 1990, a 30-year-old ranch at 11 Naomi Street with 1,182 square feet of living space on a 3,900-square-foot lot sold at the 1990 median price. In 2010, the 25-year-old ranch at 8 Suffolk Street, with 960 square feet on a 3,400-square-foot lot, sold at the 2010 median price. 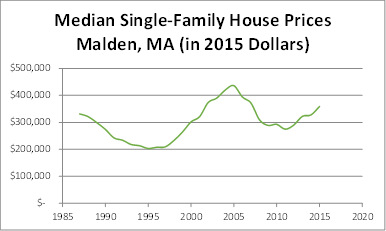 The second graph shows the Malden median single-family price, time-adjusted to 2015 dollars. 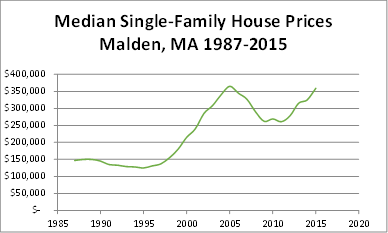 With the effect of inflation removed, the graph shows Malden's single-family price declining from a 1987 peak to a low in 1995, then rising to a new peak in 2005, then again declining, before reaching a level equal to the 1987 level in 2014. The Reenstierna Associates Report is published as a service to the clients of Eric Reenstierna Associates, LLC and other real estate professionals. The views expressed are those of the articles' authors and do not necessarily reflect those of other members of the organization. Copyright 2016. All rights reserved.